Last year, he engineered Arda's 34 million Euro mega-move from Atletico Madrid to Barcelona, further confirming the 29-year-old as Turkey's most expensive ever player. Bulut boasts of close ties to the game's “super-agents” Pini Zahavi and Jorge Mendes, and Fali Ramadani, the Macedonian intermediary with great influence over southeast Europe’s football transfers. The bio on his website, footandball.com, says he represents Mendes's interests in Turkey. Like his purported Portuguese associate, Bulut's deals are murky. Documents contained in the Football Leaks cache show that on at least two occasions Bulut took huge commissions from both clubs and players during transfer and contract negotiations, in apparent breach of FIFA's and the Turkish Football Federation’s conflict of interest rules at that time. Over a million Euro earned through these dodgy back-room deals was to be funnelled into his tax-free, offshore company in Dubai. The meteoric rise of the twenty-nine-year-old Turan, often referred to by his first name, Arda, from a poor Istanbul neighbourhood to the grandiose surroundings of the Camp Nou, started at the Turkish club Galatasaray in 2000, when he was still a child. The twelve-year-old wonderboy took only 15 minutes at a trail session for Turkey's most successful club to convince its coaches he was special. Even in these early days, deals negotiated by Bulut were suspect. Copies of Arda's four-year employment contract, analysed by The Black Sea, show a standard salary of 2.5 million Euro per year. But in addition to the hefty bonus clauses, the document stipulates that Atletico reroute 15 per cent of his wages, untaxed, to an unnamed image rights company. And if Arda's company is in an offshore jurisdiction with low taxation, he may have saved himself hundreds of thousands in taxes. Spanish tax authorities are now scrutinising players’ use of images rights companies, suspecting that the schemes are facilitating tax evasion on a huge scale. Officials at the Agencia Tributaria – the Spanish tax agency - launched investigations into several La Liga stars in recent years, including Lionel Messi, Neymar and Javier Mascherano. Not only were they forced to pay millions in back taxes to the state, the trio, and others, faced criminal charges. Meanwhile, over the next two seasons, Arda played a leading role in the Atletico Madrid line-up and, by the summer of 2013, Bulut was lobbying for a better deal for his prized asset - and himself. Atletico, keen to retain their star's services, convinced the Turkish captain to sign a new contract in September 2013 which media reports say increased his earnings by a million Euro a year. The agent had done his job. Bulut claims that his success is down to his devotion to ensuring that his players “sign the best contract” for them. 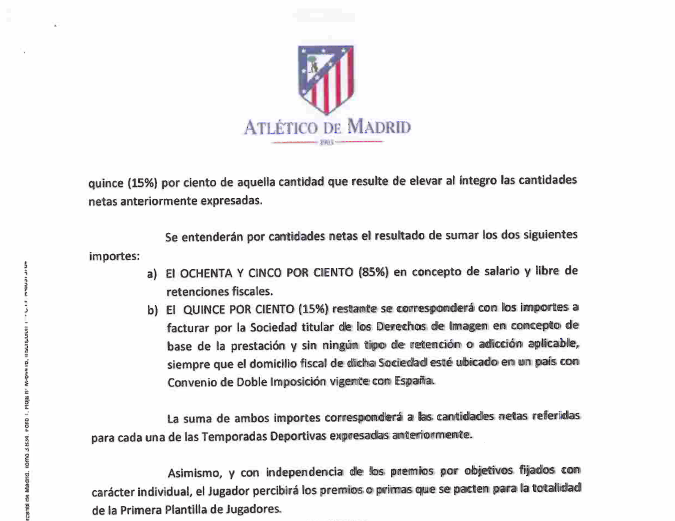 But another previously undisclosed contract details a hidden financial arrangement between the agent and Atletico Madrid, suggesting a significant conflict of interest in the negotiations. 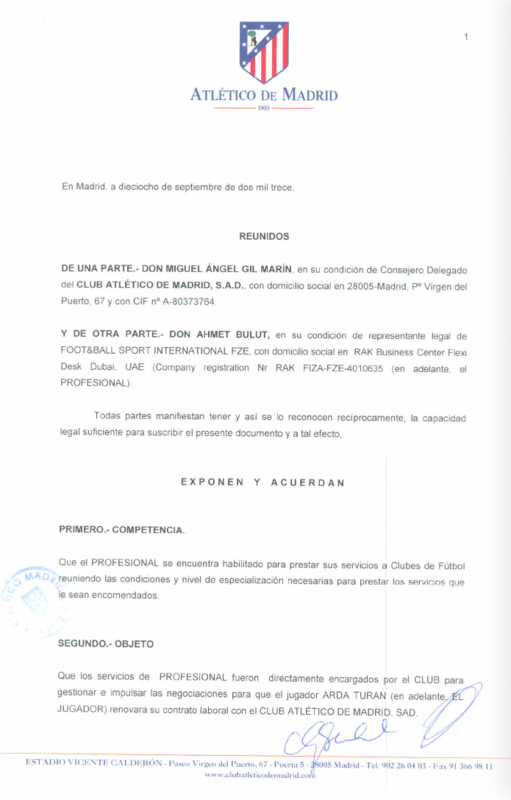 The “Commission Agreement”, dated only one day after Arda signed his own contract, shows that the Spanish club agreed to pay Bulut 1.5 million Euro into an offshore account if he could “manage and promote the negotiations so that the player ARDA TURAN… will renew his labor contract” with them. European clubs, like Atletico, hire their talent; players aren’t self-employed. Arda’s reputed salary bump to 3.5 million Euro a year is what remains after Atletico pays his income taxes. If Bulut’s 1.5m fee was included, Arda would likely have to pay an extra 315,000 Euro to cover Spain’s 21 per cent VAT. Instead, should Atletico Madrid pay Bulut’s commission, it can, as a business, write it off as an expense, and save Arda and itself thousands, or even millions, in the long term. This was the case with Arsenal and former Real Madrid midfielder, Mesut Özil, as reported by The Black Sea last week. During his transfers to Real Madrid and then Arsenal, the clubs paid his agent’s fees for him. In February this year, the Agencia Tributaria judged that these payments were an “income advantage” to Özil, and that it was he, and not the clubs, who should have paid the fees –since the agent was acting on his behalf. Özil had to shell-out 2.17 million Euro in fines over his scheme. Dubai's 'Free Zones' are tax-free special economic areas offering maximum confidentiality and minimum documentation to foreign entrepreneurs. In June 2013, Bulut assisted Jorge Mendes's company Gestifute Ireland in the transfer of Bruno Eduardo Regufe Alves from Zenit St Petersburg in Russia, to Fenerbahçe. For this, Mendes split the commission fee, and Bulut walked away with another 187,500 Euro in his Dubai account. These offshore payments, and half a million in later fees also designated to the account, were not declared in Turkey, Bulut could have potentially saved anywhere between 4000,000 and 700,000 Euro in taxes. Bulut did not answer respond to questions about his offshore company and tax affairs. “Transfers which are conducted through foreign offshore companies help black money come into the system, but it also is one of the most effective instruments used for tax avoidance.” He said. Another clause in Bulut’s contract with Atletico entitled the agent to ten per cent of Arda’s future transfer fee, or ten per cent of any compensation payment Arda might be due if the club terminates his contract early - effectively a form of 'Third-Party-Ownership' (TPO), and against FIFA rules in force at the time. On 11 July, Arda became Barcelona's fourth most expensive squad player, and seventh in its history, signing a five-year contract with a four million Euro basic salary. 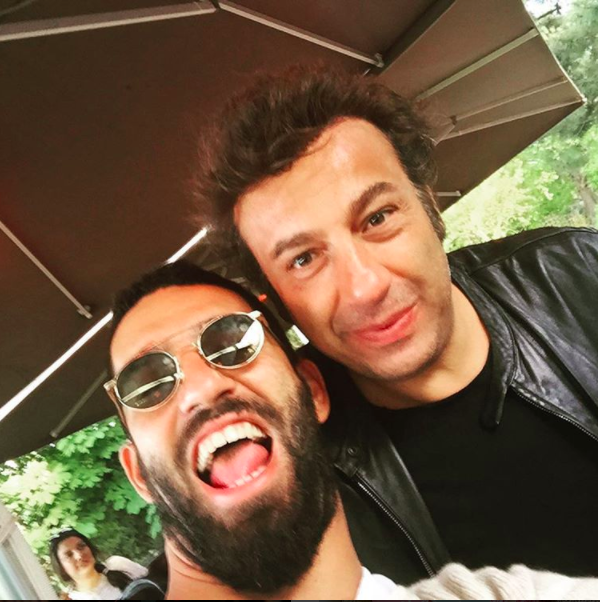 Bulut says that Arda cried with happiness. Arda's comment that he “had no involvement in the transfer. This is completely the success of my manager, Ahmet” shows the power he placed in the former goalie's hands. Arda's start at the Camp Nou was stalled until January this year because of FIFA sanctions. The team was banned from purchasing new players because of breaching rules on the number of minors. Neither party would comment whether the ten per cent transfer payment due to Bulut as per his 2013 commission agreement were ever paid. For Bulut, it seems that laws and regulations that affect his work are something to be dismissed with the stroke of a pen. All Bulut’s professional agreements found in the Football Leaks data contain a curious clause. The contracts, seen by The Black Sea, contain a specific language dismissing FIFA's regulations, including the earlier ones with Atletico. Why Bulut imposes an unenforceable clause in his contracts is revealed during a discussion last year with Uram’s legal representative, Stefano Malvestio. Malvestio objected to its inclusion in the Fernandão commission document. He wrote to Sami Dinç, partner in Turkish firm Koçak & Dinç, Bulut’s lawyer and legal advisor to Fenerbahçe in late June 2015. Clube Atletico Paranaense did not answer The Black Sea’s questions, and nor did Bulut. “If there are multiple transactions regarding the transfer of a player and if there are secret agreements, this is hundred percent about laundering the money and/or a tax avoidance operation,” says football finance expert Tugrul Aksar.